The other day, I heard a story about a boss whose employee approached him for encouragement. The employee was working on a project, and he asked the boss how he thought it was going. The boss replied with something along the lines of, "I am not your mother. When you finish the project, we'll see how you did." All of the people who were with me laughed at the story, recognizing the employer's approach as unhelpful. But I didn't. … I really like that "I am not your mother" line. It's military, hard-nosed. It's macho. Tommy Lee Jones. Mark Messier. There is an oft-told story—one that might even be true—that in 1987 Messier grabbed Kent Nilsson, a flashy but fainthearted Oilers forward, and told him that if he didn't play harder, he would have to kill him… Another former Oiler, who won't confirm the Nilsson story but doesn't exactly deny it, either, says, "You didn't get this from me, but I heard he also threatened [former Rangers coach] Mike Keenan." True, the "I am not your mother" approach will likely prove unproductive; why wait for your employee to come back to you with inappropriate work, only to criticize him then? And it's not terribly Jewish; Moshe's model of leadership is כאשר ישא האומן את היונק, the nurse holding a baby. It's the shepherd tailoring his style for every sheep, per Shemot Rabbah. But something in the curmudgeon really appeals to me. Maybe it's my New York upbringing. "G-d, please bring back my son"
Rabbi Moshe Alshich's son left Judaism; the circumstances are not recorded, although someone has written on the Alshich's Wikipedia page that he was "taken" and he became Muslim. The Alshich asked the Ari z"l for help, and the Ari gave him a kabbalistic prayer to recite, for Gd to help his son return. As the story is told by the Ari z"l's main student, Rav Chaim Vital, the son returned to Judaism. • What happened to Free Will? • What happened to the talmudic dictum, "All is in the hands of Heaven, other than awe of Heaven"? • Of what value is repentance which is not only catalyzed by, but actually performed by, Divine intervention? • And a child of the modern age may well be offended: Who are you to judge others, and pray to Gd that they be reformed? I intend to speak about this in a pre-Selichos shiur on the first night of Selichos; for now, the prayer itself appears below, as it appears in three editions with significant variations. The first yichud is to return a wicked person in repentance. This was for Rav Moshe Alshich, regarding his son who had assimilated, and my master taught him to contemplate this yichud to return him in repentance. It was effective for him, and he returned to the religion of Israel. You know that the blessing of "Return us, our Father, to Your Torah" in shemoneh esreih is in the emanation of Understanding, which is called Return, and so when you reach this blessing in your prayer, recite this prayer before the end: "May it be Your will, HaShem, our Gd and Gd of our ancestors, that You tunnel beneath Your throne of honour and receive the repentance of so-and-so, for Your right hand is extended to receive those who return. Blessed are You, Gd, who desires repentance." This is good for every Jew, to earn merit and provide merit for others, and certainly one must pray for the wicked of the generation to repent, as is seen (Berachot 10a) that Beruriah, wife of R' Meir, said, "It is written, 'May sins end,' not 'May sinners end.'" Therefore, I will arrange for each man and woman to say this prayer in the blessing of, "Return us, our Father, to Your Torah, and bring us close, our King, to Your service." He should say: May it be Your will, HaShem, our Gd and Gd of our ancestors, that You tunnel beneath Your throne of honour for the repentance of so-and-so and all who violate Your command. May their heart be reversed to perform Your will wholeheartedly, for Your right hand is extended to receive those who return. And return us with complete repentance before You. Blessed are You, Gd, who desires repentance. כתב האר״י (שער היחודים דכ״ג ע״ג) מי שיש לו בן או אח או קרוב אחר ח״ו שהטה מדרך טובה לדרך רעה או שהלך לתרבות דעה, יתפלל בתפילת י״ח בברכה זו זה הנוסח, ואז מובטח שיהפוך לבו לטובה בעזה״י. וצריך להתפלל עכ״פ שלושים יום ערב ובקר וצהרים, ובפרט בימי אלול שאז הוא עת רצון, ומכ״ש על עצמו שצריך שיתפלל שיהפוך לבו לטובה. וז״ל: השיבנו אבינו לתורתך וקרבנו מלכנו לעבודתך והחזירנו בתשובה שלמה לפניך. יהי רצון מלפניך ד' אלקינו ואלקי אבותינו שתחתור חתירה מתחת כסא כבודך להחזיר בתשובה שלמה כל פושעי ישראל ובכללם תחזירני אני פב״פ ופב״פ בתשובה שלמה לפניך ד', כי ימינך ד' פשוטה לקבל שבים. ברוך אתה ד' הרוצה בתשובה. The Ari wrote: "One who has a son or brother or other relative who has strayed from the good path to the bad or who is engaged in bad behaviour, Gd forbid, should pray this text in this blessing in shemoneh esreih. He can be certain that this will turn his heart for the good, with Gd's help. He must pray at least thirty days, evening and morning and afternoon, and especially during Elul, the time of desire. He certainly should pray thus for himself, that Gd turn his heart to the good. This is the text: Return us, our Father, to Your Torah, and bring us close, our King, to Your service. And return us with complete repentance before You. May it be Your will, HaShem, our Gd and Gd of our ancestors, that You tunnel beneath Your throne of honour to bring back in complete repentance all of the sinners of Israel. Among them, return me, and so-and-so, with complete repentance before You, for Your right hand, Gd, is extended to receive those who return. Blessed are You, Gd, who desires repentance. 1. I need only work harder in order to get where I need to go. Failure is not about moral weakness or a demonstration of a flawed character requiring introspection and reconstruction of the self, but only a practical, technical error or non-achievement of a goal. 2. I need not appeal to a higher authority, or another party at all, for aid. It's all in my hands. Contrast this with the classic Jewish idea of appealing to Gd for aid against the inclination toward sin, and the need for the assistance of mentors and peers in creating the right environment and incentives for growth. 3. I have already perfected myself after past failures, and can reflect on my growth from the perspective of success. What Torah-based writer will refer to himself as having righted his wrongs and succeeded? What Jewish Jordan would ever present himself as a finished product? And yet, I love these lines; they sit in a file that is always open on my computer, and they inspire me throughout the month of Elul. I love that arrogance, the assertion that it really is in my hands. It's almost like Elazar ben Durdaya's recognition regarding his own repentance (Avodah Zarah 17a), אין הדבר תלוי אלא בי, "It depends only upon me," but stronger. It ain't Rav Kook, but it works for me. I grew up in a shul which had the standard, twentieth century, heavy metal yahrtzeit board, with heavy plaques attached. The plaques were flanked by sockets for small incandescent light bulbs, which flickered constantly. You can see models here. 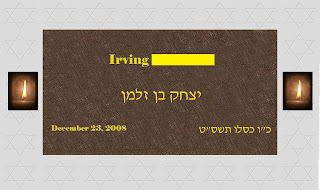 At some point, though, my shul (Young Israel of Oceanside) made the leap to a new form of board: Custom-made wood boards, finished to match the shul's décor, on which the plaques were attached. Instead of sockets for individual incandescent bulbs, one vertical flourescent bulb lined each column, behind the board, and each plate was flanked by holes which could be sealed (ie off) or left open (ie on). 4. The old boards are very dated, in their appearance. Why don't all shuls switch to similar newer, cheaper, more effective memorial boards? Largely because they already have multiple old boards. Members don't want the new boards to look different. Members don't want the new ones to look less expensive. Members don't want to have change, in general. In truth, my shul in Allentown went even further. When it came time to add a board, we revamped the system altogether. At the impetus of a particular member who took this on as a personal project for the shul, we set up a digital picture frame showing a digital nameplate plaque. On a given day, the picture frame scrolls through all of the plaques for the day's yahrtzeits. On a yizkor day, the frame scrolls through all of the plaques. Aside from solving the problem of running out of space, anchoring new boards, affording new boards and so on, this also made my job easier. Standard boards require that someone go through them every few days, turning bulbs on or uncovering spots for upcoming yahrtzeits and turning the bulbs off or covering up spots for yahrtzeits which have passed. Now, it's all automated, using databases to regulate what will be displayed, and when. The only regular adjustment is the display's on/off time, to make sure it is operational when people come for minyan in the evenings. I admit that I was disturbed, at first, by the possibility that people who had memorialized their loved ones in the old system might not see this new method of display as adequate; after all, we had contracted to light bulbs next to their plaques, not to use this newfangled system. But people were very comfortable with it, and so we went with it. Last week, I was speaking with an elderly friend and I mentioned a pursuit she "used to" engage in. Her response was morose, along the lines of, "Sure, I used to. There are many things I used to do. I have to get used to 'used to'." I felt terrible, of course; remembering what you can no longer do is a bitter experience, particularly as the "used to"s accumulate. I wanted to point out new activities she could become "used to" - authors she could read, musicians she could listen to, places she could go walking, and so on - but I was afraid of being trite. She knows perfectly well that there are new things she could do. And suggesting these new "used to"s could sound like naively and insensitively suggesting that these new pursuits could offset her losses. So I said nothing, basically, and just listened. Listening was my go-to option when I was in the pulpit. I was younger than most of my congregants, and far less experienced in life, and so I wasn't confident in offering ideas. I buried people 3-4 times my age. I met with people about their issues in raising teenagers, before I had children of my own. Drugs and alcohol, marital issues, and so on - I found listening far more useful than offering advice that had the potential to be way off. Listening has many merits of its own: It allows people comfortable space to talk through their issues, it validates the speaker, it educates the listener. Mishlei 12:25 says, "Worry in the heart lowers it (ישחנה)," and in a play on words we read the clause, "One who has worry in the heart should speak of it (ישיחנה)," because of these benefits. But on its most basic level, listening is useful because it's "first, do no harm" safe. I wish I could have said something to help my "used to" friend feel better, but I guess I'm okay settling for safe. For me, Elul is timed fortuitously. My last Shabbos in the pulpit was Parshas Eikev, and every year, at this time, I feel the pain that came with leaving it. Three years later, I understand the benefits I now have and I am at peace with the move, but I still miss it... until, not long after Parshas Eikev, along comes Elul, and I remember what Elul meant in the rabbinate. And that makes the decision to leave it much easier. In any case: A week from Monday night, I will present a "yahrtzeit shiur" in memory of Rav Kook, Gd-willing. [Yes, the yahrtzeit is this Monday night, the third of Elul, but the scheduling did not work out.] I'll be looking at a poem which has obvious Elul resonance, titled "Shofar". It was written in 1912/1913, soon after he made aliyah. In the poem, he puts the return to Israel in terms associated with the ultimate Resurrection of the Dead, and he calls upon the reader to be moved by the visible effects of our exile and catalyze this redemption. the suffering of the lowly nation. and so the graves will quake. to build up the ruins. to the exile in which they had been dispersed. This is likely Yeshayah 18:3, but note Shoftim 3:27. This is an important verse; he uses Hebrew terms which can refer to streams and sprinklings, but can also refer to ideological streams and errors. Rav Kook is referring to Jews who have naively strayed. For me, one of the toughest arenas in Jewish education is Tefillah (prayer) - how to make it appropriately meaningful for children at different ages, and how to train children to further evolve in it as they grow older. * Is it better for teachers to daven with the group, or to daven beforehand? * May we abridge parts of davening for educational reasons, or does that send the kids the wrong message? * May a student be "kicked out" of minyan for discipline? You can see Rabbi Schiowitz's page here. In a mishnah (Kelim 17), R' Yochanan ben Zakkai described people's deceptive practices, and he said, "Woe is me if I say it; Woe is me if I don't say it!" As expanded in a braisa (Bava Batra 89b), R' Yochanan ben Zakkai was worried that teaching these methods would promote deceit, and that not teaching them would encourage people to sin, believing they could get away with it. I rarely check my Facebook wall, but occasionally I do read Friend updates on it. Updates aren't only the messages you choose to send; if you log into a website using your Facebook account, that site can post updates on your friends' walls, telling them (and anyone who looks at their walls) what you have been doing on that site. So if you log into a video site with your Facebook account, for example, my wall might tell me what you have been watching. This post is sparked by a note which has appeared at least twice on my Wall in recent days, something along the lines of: "Your friend Ploni checked out this picture on Mobli". The picture's title says it is an inappropriate photo taken by "Beis Yakkov" girls. [Don't bother looking at my Wall to find out who looked, or to find the picture – the posts have been banished.] Looking at a picture with that description would be inconsistent with the public identities displayed by either Ploni. There are many reasons why someone might have loaded the picture, ranging from prurience to curiosity to an unintended set of clicks. I have also ended up in places I didn't belong at various times – see my post on Internet filters for more on that – and for all I know, those are noted on others' Facebook walls. But not every click is innocent, and it might be good for people to realize that their friends, and their friends' friends, are watching. So I am posting this to tell those who might be lured in against their better judgment: Know that sites do publicize your surfing habits. Woe is me if I say it, lest that encourage people to find underground ways and escape detection. Topic for today: Bar Mitzvah Lunacy. But no, this is not the standard off-the-shelf rant about costly parties or questionable celebrations. It's about the teenage Shabbaton that comes with the celebration. I'm talking about the practice of gathering a class full of twelve- and thirteen-year-old boys [as well as girls, in some communities] for Shabbos, concentrating a critical mass of flammable early adolescent rivalries and neuroses and hormones and egos in one location. I am young enough to remember the things our class did at that age, running around in packs at these Bar Mitzvah weekends. Consider that no one really owns responsibility for kids who gather for these Shabbatonim. The bar mitzvah family may provide meals, and may even arrange activities and walking groups. The host family provides a safe home in which the kids can hang out, and perhaps even sleep should they wish to do so. But that leaves a lot of time and opportunity on teenage hands. Consider that research demonstrates that teen brains are wired for risk, and to succumb to peer pressure. To quote a CNN article, "It's not that adolescents don't understand risk. They understand it perfectly well," says Beatriz Luna, a neuroscientist at the University of Pittsburgh. "It's just that they find it more rewarding to impress their peers, and things of that sort, than the risk that's involved to their actual survival; it's just what they value at that point." So why, exactly, do we think it's a good idea to do this? Of course, we want our children to celebrate with their friends, but I'm surprised we have not evolved a better method. Thank Gd, I survived my year of trips to the Washington Hotel, Long Beach, Far Rockaway, the Five Towns, and so on. And, thank Gd, my firstborn managed this rite of passage just fine over the past year. But it really seems odd to me. I believe that shuls which want a davening-focused experience should make sure their 'management' – the rabbi, president, gabbaim – exemplify it. Of course, managing davening may require talking from time to time, such as when the expected baal musaf doesn't show up and the gabbai needs to recruit. Nonetheless, much can be done in advance, and much can be handled by brief signaling or by leaving the room for a quick conversation. When I was in the pulpit, I kept signs by my seat for particular occasions, to be handed to people as needed. One said "Please slow down," and was meant for chazanim who were leaving the minyan in the dust. Another said "Don't wait for me," for occasions when I wanted to take my time with shemoneh esreih. A third said "No Tachanun" as a heads-up for the chazan. I had more, but these are the ones I remember. What other signs should a rabbi have at his seat, or a gabbai at his post? Why do you go to a shiur? A couple of weeks ago I spoke to a group of Jewish and non-Jewish college students about Jewish life in North America, and as part of this I explained what our kollel does in Toronto. As part of the discussion, I was asked why adults come to classes. It's an opportunity to be in a safe Jewish environment, with people who share your background and ideas. What else? Why do you go to shiur, as opposed to learning with a chavrusa? A recent article on the success of Chabad-Lubavitch cites the following from Dennis Prager: [T]he happiness that the vast majority of Chabad rabbis and their wives radiate is perhaps the most powerful asset in the Chabad rabbi’s arsenal. That they maintain this cheerful demeanor given their often-difficult financial and social situation is a credit to them – and to their faith. Case in point: My trip to the Daf Yomi Siyum haShas, and then back home, last week. What should have been a simple flight from Toronto City Airport to Newark, with a train into NYC to visit family and then a train to Secaucus, became a full-day ordeal. Wandering around downtown Toronto looking for the shuttle from subway to airport. The train into New York City was delayed another 40 minutes, while we waited in the rain. Just missing the subway from Penn Station. What should have been 90 minutes with family reduced to just 20. The hotel shuttle from the train station that never showed up, so that I wandered in and out of puddles for another 45 minutes before taking a taxi. Trudging through mud from the hotel to MetLife stadium, because the hotel shuttle was taking forever. And that was just the trip there… the return trip was another saga. I am not a person who deals particularly well with frustration, even under the best of circumstances – let alone in 90-degree heat followed by torrential rain, while carrying a heavy backpack and wearing a suit, and thinking about the time I was losing from meeting various responsibilities. The only thought that kept me sane during that trip was this: If I'm not doing what I had planned, it's because Gd has a different idea of what I should be doing. Perhaps it was the mishnah I had the chance to learn while waiting for the New Jersey Transit train. Perhaps it was the random encounter with an old friend on the train. Perhaps it was the opportunity to be a recipient of chesed, when the person with whom I shared that taxi decided to foot the bill himself and spare my last American cash. Or perhaps it was simply the patience I had to practice. I don't know, but the mantra has worked for me on occasions large and small, from career changes to traffic jams: If I am here, instead of the place I planned to be, it's because there is something more important for me to do here. "Our mind is on you, and your mind is on us"
The Daf Yomi siyum hashas at MetLife Stadium was outstanding last night (notwithstanding a bizarre two days of delayed/mislaid/cancelled flights, shuttles and trains to get there and back). Being there was a joy, and celebrating with people I did the daf with for years was beyond that. I am grateful to those who brought me there. As part of the formal celebration of a siyum, we address the text we have studied, and say, "Daatan alach, v'daatach alan." This would seem to mean, "Our mind is on you, and your mind is on us." The dvar torah from last night which resonated most with me took this phrase in a homiletic direction. Rav Dovid Olewski, Rosh Yeshiva of the Bais Yisroel [Gerrer] yeshiva [update: It's available at 3:27 of the video available here] explained "daatan alach", "our mind is on you," to refer to the way a student of the Daf Yomi keeps his mind on that day's Talmud study, regardless of where he is and what he is doing. He goes to work, he sets aside time to learn. She goes on vacation, she sets aside time to learn. No matter where or when or what is going on, despite pressures for all sorts of other things, the Daf is on your mind. "Our mind is on you," we say to the Torah. He then continued to explain "daatach alan" along the lines of "your mind is in us," referring to the way a persistent student of Torah absorbs a Torah perspective. Eventually, after many years of true dedication, he will be able to predict a sugya, she will be able to intuit the way Torah would approach a particular question. I would add another point, within this "daatach alan" - We become truly aware of just how broad Torah is. I distinctly remember when I first came to feel that appreciation for Torah, that awareness of what we mean when we say (citing Iyyov 11:9) it is "longer than the land and broader than the sea," a substantive recognition not simply of how little I knew, but of what it was that I didn't know. The consistency and persistence of Daf Yomi brings a remarkable bond with Torah. Dedicating yourself to any field of study for such an extended period of time, pushing yourself through all of life's events, through work and play, through family gatherings and crunchtime at work, through happiness and depression, through the various seasons, bonds you with that which you study. And doing it not only with a field of study, but with specific personalities who accompany you along the way - your chavrusas around the table and your chavrusas on the page - deepens that experience still further. I have my misgivings about Daf Yomi, as I noted in a post here some time back. But this is a definite benefit. "Daatan alach, v'daatach alan." May we continue to keep our minds on you, and may your mind enter into us. 12 Lehigh Valley men will join 120,000 Jews finishing Talmud study. When Roberto Fischmann began studying the Talmud, he had daughters in high school, middle school and grade school. Now, the eldest daughter is a researcher at Massachusetts General Hospital, another is studying electrical engineering at Duke University and the youngest is about to graduate from Moravian Academy in Bethlehem Township. "I've been doing this so long," he said recently after a session in Congregation Sons of Israel in Allentown, "it seems like a lifetime." Fischmann, 49, an Allentown businessman, is about to finish his 63-volume, 2,711-page undertaking. Reading a page a day, it took 71/2 years to wade through the complex tracts of Jewish legal, ethical and philosophical teachings that date to the Revelation of the Torah on Mount Sinai. On Tuesday, in a collective celebration, Fischmann and a dozen others from the west Allentown synagogue will join 120,000 Orthodox Jews in New York, New Jersey and around the world to read the final page of the Talmud. The "Siyum HaShas," as the gathering is called, will fill Madison Square Garden and the Continental Airlines Arena in New Jersey. Similar gatherings will take place in 40 North American cities and in countries across the world, including China and Africa. All are practitioners of Daf Yomi, a method of studying the Talmud that utilizes the page-a-day system. Allowing for time differences, Jews across the world read the same page on the same day, enhancing a sense of religious and spiritual unity. "It's mostly Orthodox, but you will see a wide range of Jewish practice at the Siyum HaShas," said Rabbi Mordechai Torczyner of Congregation Sons of Israel. "Some will have beards and black clothes, others will not; some study the Talmud all day, others for an hour." Six mornings a week, the Daf Yomi study group gathers in the library at Congregation Sons of Israel. Rabbi Daniel Korobkin, now in Los Angeles, started the group in 1997. Two men, Fischmann and Henry Grossbard of Allentown, have been members since the beginning. For Grossbard, 73, an industrial engineer, the morning sessions are an integral part of his daily routine. Up at 6 a.m., he's at the synagogue by 6:45 a.m. for Daven, the morning prayer service. By 7:45 a.m., he's delving into the depths of the Talmud. In its complex polemics, Grossbard finds the meaning of life. "To me, this is our life," he said. "In order to understand and know it, you must study it." Torczyner, who leads the sessions, explained that Jews originally handed down their traditions orally. Then, when the Romans banned teaching the Torah on penalty of death, they began writing them down. By the 3rd century, there was a canonized text called the Mishnah. By the 6th century, it had grown into the Gemara. "The Talmud combines them all," Torczyner said. "It contains ethics, philosophy, medicine, advice on living -- all facets of life." In the Schottenstein Daf Yomi Edition, used by the Allentown group, the Talmud passage is in the center of the page, surrounded by commentary from rabbis across the ages. On a given issue, students can read the original text and the opinions of rabbis in 11th century France, 13th century Syria or 17th century Poland. Fischmann compares the system to an Internet link, its passages allowing the student to go back and forth in history. Roger Nagel of South Whitehall Township, a computer science professor at Lehigh University, finds the Talmud insightful and stimulating. Its ethics, he said, parallel those in courses he teaches. The Talmud's tractates, or books, contain discussions on the courts, their powers and justice. It examines social classes, positions of power and the humanities. Nagel has discovered not much has changed from ancient times to the present. "You still have the good and the bad," he said. Using a kind of inquiry method, the rabbis of the Talmud argue with one another rather than make pronouncements. Jeff Blinder, who's been studying the Talmud for three years, describes the method as "conflict, then agreement." A retired radiologist, Blinder is so committed he takes the Talmud with him when he volunteers at a hospital in Alaska. "I study the Talmud," he says with a chuckle, "with the only Jew in Ketchikan." Blinder finds comfort in that, through Daf Yomi, he's reading the Talmud with Jews around the world. "The amazing thing is that in London, France and South Africa -- across the entire world -- we're all reading the same page," he said. "The idea of an international community of Jews all doing the same thing on the same day is exciting." Roberto Fischmann has a degree in engineering and a master's in business, as well as a law degree from the University of Virginia School of Law. Yet, he finds the vastness of the Talmud intellectually challenging. "I don't think I ever took a course where so many aspects were so challenging," said Fischmann. "Intellectually, it's hard to learn." Persistence, though, pays off. Gradually, says Fischmann, the universal lesson emerges. "What you eventually start learning is that, in every single aspect of life, you can find spiritual meaning," he says. In a practical way, the daily exercise has changed the way Fischmann lives. He used to wake up worrying about his business. Now, he's rearranged his schedule to put the Talmud first, business second. "It's been good for my health," he said. "I'm calmer, more peaceful." Murray Schechter, 69, who taught mathematics at Lehigh University, has been studying the Talmud since he retired four years ago. "I cannot explain the mechanism," said Schechter, whose snow-white hair and beard give him the look of a learned elder, "but the cumulative effect has changed my life." Richard Greenberg, too, begins his day with prayer and the Talmud. "You pray first, learn next," said Greenberg, 60, a retired real estate developer. "It provides structure to your life." Sitting across the table from Schechter, Greenberg projects a quite different image. Instead of a yarmulke, he wears an Eagles baseball cap and uses sports analogy to explain his commitment. The Talmud is exercise for the mind, Greenberg says, just as working out at the gym is exercise for the body. "It's a spiritual elevator," said Greenberg, "no matter who you are."